As next step (part 2) you need to get familiar with the Lean Startup methodology, even if you are already using Lean Startup or you did a workshop, you should not skip this part because you will have your “Out of the building experience” (potential client contact). In this part you will practice to get feeling with Lean Startup and more important with the product-market you have in your mind. 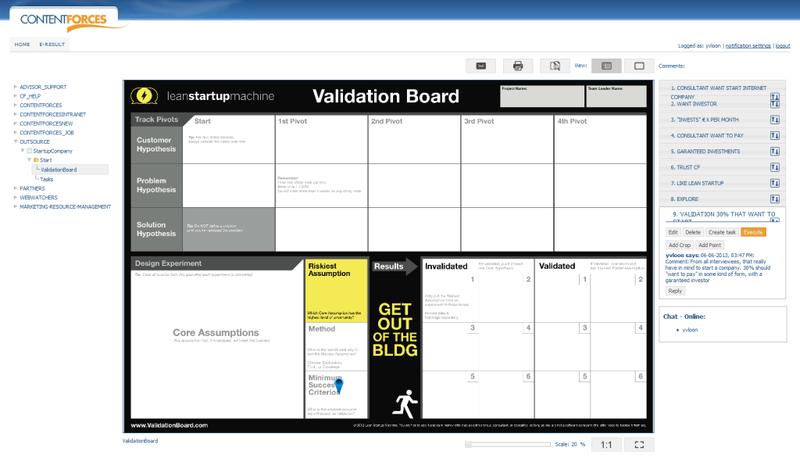 The task is to fill the Validation Board, designed by The Lean Startup Machine with minimal 1 pivot. Goal: Learn how to use Lean Startup in fast way and see how important it is to know the “problem” of your potential client. [Co-founders wanted]: There many people in Europe that wants to start an Internet company (=founder). [Co-founders wanted]: Founder needs a (technical) team to create Minimum Viable Product(s). [Co-founders wanted]: From all interviewees, that really have in mind to start a company. 30% should “want to pay” in some kind of form, with a guaranteed investor or other way of taking risk. Collect all “customer relation data” for eventual future use. Other learnings: the motivation to start own company is that their father had its own business.